Space probe discovery redeems Scari from naysayers who claim fraud. But it's true, there are Pigs in Space. 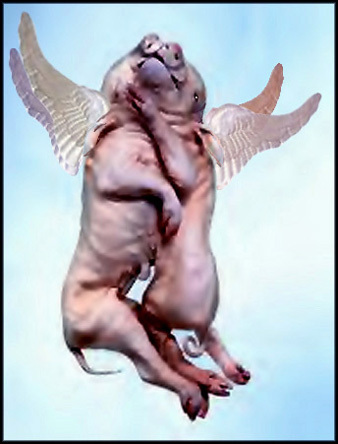 Pigs in Space were revisited in 2003 however the last space mission was a scrubb. It's too bad as the Shuttle crew claimed they had great footage of these critters floating just outside the observation deck. 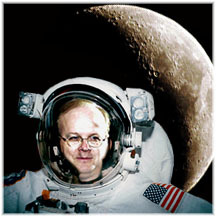 Heading up the the Pigs in Space program, Karl Rove is out in orbit plumbing the heavens for opportunity. Karl is also affiliated with the National Astrological Sciences Association and Christians On Mars for Jesus and the American Way. Siamese pigs are unusual but Siamese pigs in space are very rare. A noteworthy spectacle for connoisseurs of curiosity, observers of technical missteps and scientific mishaps. First Minister of MAP  Mars for America Program, A logical spinoff of his now famous Pigs In Space (PIS) program. Now, with Bush on Mars, the nettling details are swept aside, Looking to a brighter day for P.I.S.